DIY Easter Baskets give you an opportunity to celebrate the holiday in a more meaningful way, because you can customize them around your children’s personalities and interests. The beauty of using rain boots in lieu of more traditional baskets is that they double as a practical gift kids can use all season long. 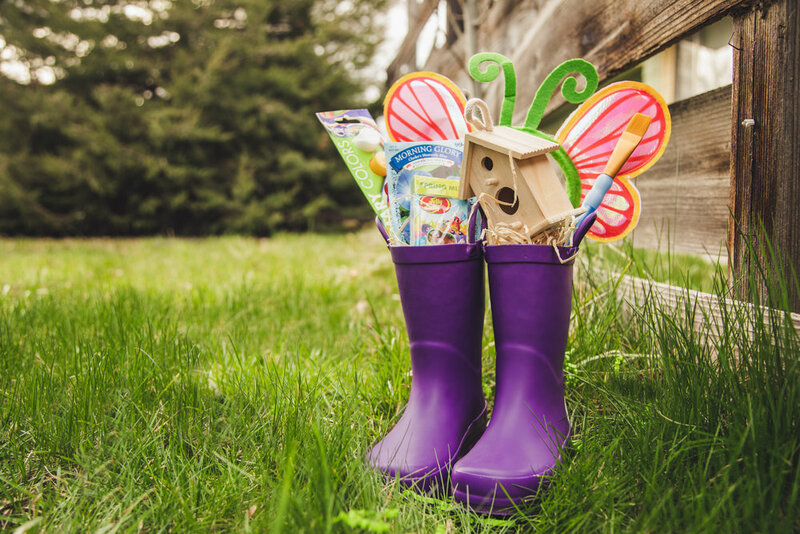 We’ve put together some fun Rain Boot Easter Basket ideas that are all about outdoor play, connecting with nature, and fostering creativity. As a springtime holiday, Easter is the perfect time to help kids develop their green thumb. Whether you have a backyard garden or simply a windowsill planter, your little ones will be excited to watch their seedlings transform into beautiful flowers, fragrant herbs, or flavorful veggies. A garden themed Easter Basket is a great opportunity to nurture responsibility, patience, and the value of caring for nature. Bonus Idea: When kids outgrow their rain boots, use them as planters! Kids with an artistic streak will love an Easter Basket filled with a wide variety of craft supplies. Encourage them to practice ‘en plein air’ with nature-themed projects like crayon leaf rubbings, a paint-your-own birdhouse, or a suncatcher made from pipe cleaners and beads. Bonus Idea: Let kids decorate their rain boots with acrylic paint! Spring brings plenty of opportunities for curious kiddos to investigate the world around them. An earth science Easter Basket is not only a great way to embrace learning, but — by including a nature journal and encouraging them to track their findings — it is also an excellent tool for developing mental focus and building an appreciation for nature. Bonus Idea: Pair rain boots with a ranger vest and hat for the ultimate explorer outfit! Hoppy Easter from all of us here at LONE CONE! Disclaimer: LONE CONE may earn a small commission on purchases made from links to products in this post. This commission comes at no extra cost to the customer.